This short OVA tells the back story of Arima who appears in the second season of Tokyo Ghoul, and was honestly a fascinating clip of the Tokyo Ghoul world. Although it is recommended that you watch both seasons of TG (Tokyo Ghoul) before touching this, I thought that it stood firmly as its own interesting piece, with a defined character. To begin, I'll discuss the artwork, sound, and story as a whole. I would argue that the artwork has indeed changed slightly from the televised versions of TG, and it gave it a very different "atmosphere." For the majority of this OVA, it really felt like a slice-of-life anime, partially because of the art, and also because of the relationship between the characters. In the past, TG characters, although close, seldom shared "memorable" moments with each other, and I was glad to see that element added to this OVA. The characters really came to life, and it got me to not only feel closer to them, but want to support them. This was the most drastic change between TG and "Jack," and it increased my overall enjoyment of this piece. My overall rating for this is a 9/10, due to its solid artwork, character development, and story. The only reason I won't give this one a perfect score is because it didn't meet my expectations in terms of action scenes and, if it's a word, Ghoulishness. "I always wanted to be like them. I wanted to be normal." Tokyo Ghoul : Jack, an ova I have been anticipating since it was confirmed. And now that I finally watched, I want more, a lot more. Story (9) : The story follows Fura, who belongs in a gang but then left it. One unfortunate day, he witnesses the murder of his friend by a ghoul of the name "Lantern". Wanting revenge, he and Arima start to go around killing ghouls hoping to find Lantern with the help of, Minami. There isn't much to the story, but it was quite interesting to know a little more about Arima's backstory. Unlike Tokyo Ghoul, this ova focuses on making the ghouls seem bad. But in the end, you will feel the feels when you understand that most ghouls just want to be human and live normally with the rest of us. Art (8) : The colors are quite vivid and fit this ova quite well. The gore animation wasn't too over the top like some anime could be. As expected, the fight scenes in this ova is quite good. I also really liked that character animation. Sound (8.5) : There isn't an op or ed to judge, but I must say, the OST was quite good. It fitted the anime very well and didn't seem out of place at all. Character (9) : For characters, we have the overpowered Arima and the guy who wants revenge, Fura. We also have Minami, who seems like a cute and innocent girl. There is a little character development for Fura, from a rebellious teenager to an outstanding ghoul investigator. It was quite interesting to watch the main characters interact with each other. Enjoyment (10) : The original Tokyo Ghoul series (Not Root A), is one of my favorite anime of all time. So of course, I would have enjoyed this ova and I enjoyed every single bit of it. Unlike root A, which I disappointed me a lot. 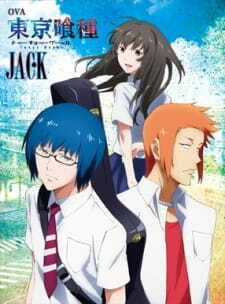 Overall (9) : I really liked this ova and can't wait for Pinto which is coming next season. I would recommend this ova to anyone who enjoyed Tokyo Ghoul. It would give you feels, when you watch the ending. I also recommend you to check out the manga series if you enjoyed it. My first ever and very simple review of this OVA. All I can say is thank you Studio Pierrot, but I still don't forgive you for Root A. They did a 180 from Root A and did not butcher Ishida Sui's work at all! Tokyo Ghoul: Jack's story, art, and characters are all beautifully adapted from the manga for our viewing pleasure. The OST is also completely brand new and fitting! You will not, I repeat, you will NOT be disappointed in by the Tokyo Ghoul: Jack OVA adaptation. The only possible downfall is that it's only 30 minutes long! Overall enjoyment is 10/10. why is Arima so powerful at a young age ? how did he end up working for CCG ?